BonBonBar’s yummy Orange Bars combine pecan nougat bars with candied orange peel, salted caramel and...chocolate, of course! Photo by Corey Lugg | THE NIBBLE. This is Page 2 of a six-page article. Click on the black links below to visit other pages. 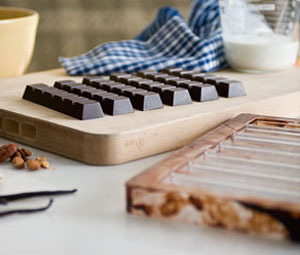 Why aren’t more people producing great handmade candy bars? I can’t answer that question, but Nina Wanat knows a good idea when it hits her, and her candy bars are always a good idea. Her packaging is not showy, and her confections are of relatively modest appearance, but don’t let that deter you. Try the Orange Bar, a two-layered beauty of nougat with pecans on the bottom and orange-peel-infused salted caramel atop. 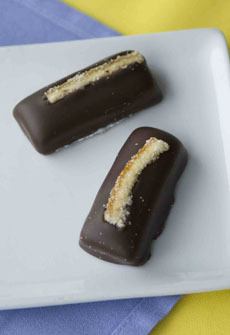 It’s covered in dark chocolate and decorated with a strip of candied orange peel dusted with muscovado sugar. Everyone at THE NIBBLE offices swooned over it. If you like more of an emphasis on nuts in your candy bars, the Caramel Nut Bar is for you. That’s a sectioned, dark chocolate-covered bar filled with salted caramel, organic mixed nuts, and cacao nibs. Nina even has a Scotch Bar that uses a single malt, and enough of it to make a Scotch lover take notice. Our editorial director, a connoisseur of single malts, gave it the thumbs up...and declared it an excellent gift for any Scotch drinker you know (she included herself on the list and asked for half a dozen, plus the Orange Bars). The use of salt is subtle; you’ll taste it, but it doesn’t overwhelm the other flavors. As a non-bar bonus, BonBonBar offers marshmallows and hot chocolate mix. I haven’t tried the latter, and her Vanilla Marshmallows are very nice, but the Passion Fruit Marshmallows were a revelation (I normally don’t care for anything flavored with passion fruit, but I could eat these all day—and they disappeared in the office faster than you could say marshmallow). Sorry, Los Angelinos, there’s no BonBonBar retail store as of this writing, but you can find her products at other local emporia...or buy them online like the rest of us. 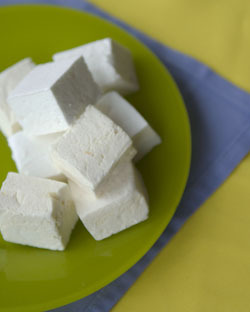 Passion Fruit Marshmallows in the front, followed by Vanilla Marshmallows. Delicious for dipping in a Valentine’s Day chocolate fondue. Photo by Corey Lugg | THE NIBBLE. Freshly made Caramel Nut Bars.